Joseph L. Mankiewicz was one of Hollywood’s most prolific and successful writers, producers and directors. After 17 years as a writer, Mankiewicz’s first attempt at director was an adaptation of an Anya Seton novel, “Dragonwyck”. The book was a large potboiling American gothic melodrama, which Mankiewicz expertly condensed and distilled into a 100min film. The film is a classic brooding chiller full of ghostly apparitions, haunted houses, psychotic madmen, against the historical backdrop of early colonial America. The story takes place in 1844 New York, a humble god-fearing young gal named Miranda Wells (Gene Tierney) is asked by her wealthy cousin, Nicholas Van Ryn (Vincent Price), whom she’s never met, to be caretaker to his young daughter. Miranda desires to escape the drab farming existence of her father (Walter Huston) and become a woman of society. Miranda travels to the brooding fortress of a home which is dubbed “Dragonwyck”. Despite the snobby objections of the other aristocrats, Miranda is ingratiated into the upper class of New York by the charming yet aloof Van Ryn. There’s more to Van Ryn than just charm though, he’s rules his lands like a tyrannical despot, which angers the humble farmers. There’s also talk of the ghost in the house who plays the harpsichord at night. After Van Ryn's wife dies he courts and marries Miranda and over the course of several years makes her life a living hell. Though Gene Tierney and Walter Huston get top billing, the film is a showcase for a young Vincent Price. It’s a great brooding performance who brings the elegance, charm and mystery to the Van Ryn character, an early indication of the horror film star he'll soon become. Harsichords, shadowy mansions, ghostly curses make for a great Hollywood melodrama. But the film begins wholesome and bright and gradually moves to the shades of grey and deep black. Early on Mankiewicz establishes a John Ford-like tone. The cheerful music and bright black and white cinematography in opening act reminded me of Ford’s “How Green Was My Valley”. In fact, Mankiewicz hired the same DOP (Arthur Miller) and the same composer (Alfred Newman). The masterful talents of these craftsmen help Mankiewicz gradually shift the tone toward the dark side. In addition to the mystery of Van Ryn and his nefarious intentions for Miranda, there’s a historical story about the land owning policies of the Patroons, which the Dutch settlers brought over to their New York colony. Though everyone is American now, the remnants of this Dutch class system continued to exist. The film was made in 1946, and I think Mankiewicz may have got away with some subtle Communist subtext. The conflict between the land owning Van Ryn and his farmers who are not allowed to own the land they work on continually eats at Nicholas, until, in the end he is beaten by the steadfast workers. Mankiewicz would explore class rivalry and social politics to even greater effect later in 1950’s multi-Oscar winning “All About Eve”. Mankiewicz would go onto a great career well into the 1970’s bridging the old studio system and the film school generation. 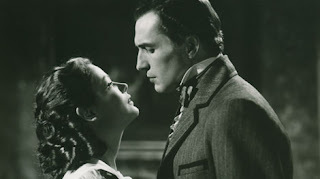 “Dragonwyck” is a fine first film to rediscover.